Going out for drinks with my friends is a 95-percent fun experience. The 5 percent of my evening that isn’t fun is familiar to most women and LGBTQ people—it’s the numerous instances throughout the night when I’m being vigilant. Sometimes this vigilance is conscious. I finish my drink before using the restroom, so I don’t have to leave it on the bar and vulnerable to potential tampering. I verify that my Lyft is already outside before departing the bar, so I’m not waiting alone in the dark. My friends and I travel together when walking to our respective homes as much as possible. And I don’t even live in a big, scary city. Other times, this vigilance is subconscious. I text my boyfriend when I’m heading home, mostly just to say hi, but also so he knows something’s wrong if I’m not through the door in 20 minutes. I scan bars for men who look too drunk, loud, or aggressive. I choose a barstool near other women if I’m by myself. 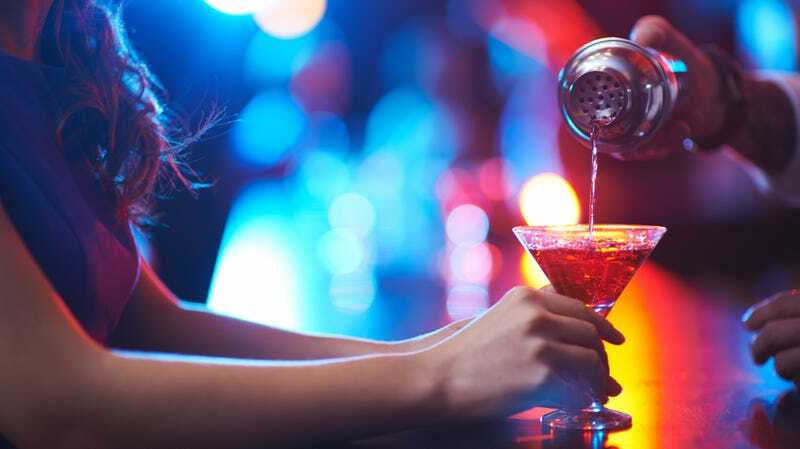 We’re conditioned to make these small moves to stay safe, because the prospect of having your drink spiked or becoming the victim of harassment or assault is frighteningly common. If it hasn’t happened to you, it’s happened to a friend of yours. The solution to the problem of women and LGBTQ people feeling unsafe in bars is clear: Predators need to stop being predators. Men need to do better and hold themselves accountable. But while I light prayer candles for the eventual demise of the patriarchy, I applaud the bars that are stepping in to keep us safe with concrete policies and practices. One such bar made news this week: A Staten Island bar where multiple women have reported having their drinks spiked has begun serving drinks with plastic lids and straws (to make it more difficult to tamper with them) during evening hours. Per the AP, the bar has also hired plainclothes security guards. Bravo, The G.O.A.T. bar. Not only is there a novelty factor in enjoying your cocktail from a sippy cup—I was served wine in such a cup during intermission at a theater performance this winter, and it was kinda fun, in a spill-proof way—but it’s also a move that indicates the bar takes these crimes seriously. I also noticed The Rhino bar in Missoula, where I live, has posted flyers indicating its bartenders have undergone “bystander intervention” training. The bar has also hosted police-led classes on the topic. “What our training specifically talked about was intervening in things like sexual assault,” Missoula Police Deparment detective Jamie Merifield told KGVO years ago. “When you see someone in trouble, the training helps you to intervene, and not just turn a blind eye. Most people would want to help, they just don’t know how.” In a similar vein, other establishments around the country have introduced “angel shots,” drinks that people can order as a signal to bartenders that they’re in trouble. While training, special shots, and plastic lids alone won’t eradicate drink tampering or sexual harassment entirely, if such moves prevent even one crime, they’re worthwhile. These efforts also go a long way to showing patrons that all people are safe, welcome, and protected in that social space. Going out for drinks should be fun—100 percent of the time, for 100 percent of people.